Ever thought of going on a Bear Hunt? This fun album will take you and the kids on an adventure that will have you laughing and moving! It’s a blast! 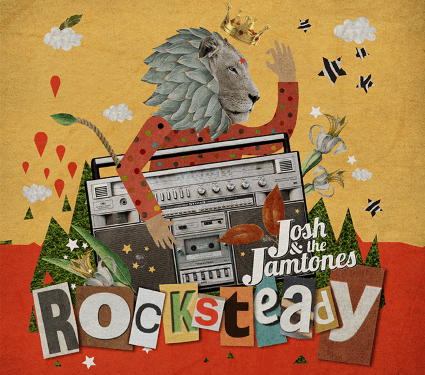 Josh and the Jamtones have brought a super fun CD for the kids. Themed around the title, they have some funny bits of comedy in between hilariously fun songs to keep us moving. I reviewed the disc in my car on my way to run errands and I have to admit that they had me dancing a bit LOL. It’s all good though, I was having way too much fun to be worried about the staring passer-byes. LOL. Sometimes I worry about myself, given all the fun I have been jammin’ out to the kids music. LOL. I’m having a hard time picking a favorite on this one, so you’ll have to check it out and pick one for yourself. 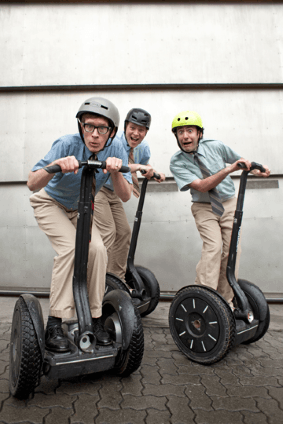 They do a great job getting us to move and with the happy upbeat voices it’s hard not to have fun with them. I’m adding this one to the list of music to jam to with the little ones! In case you are worried, it’s not the kind of bear hunt that harms anyone, it’s a loving bear hunt, but you’ll have to listen to understand why! Put this one on your list and check it out! Josh and the Jamtones perform live in various places and most recently performed at the Boston Children’s Museum’s 100th anniversary event! Plus, you can hear them on the Kid’s Place Live station! They are available for booking at events even! You could have them take you on a Bear Hunt at your own party! Now that would be awesome! If only I were a little kid… LOL. You can see a video of one of their birthday performances on YouTube! It’s an adorable video! The kids are obviously having a blast! This is a sponsored post from Disney Music and One2One Network. All opinions are always my own. I truly enjoyed Jazz Loves Disney! Jazz Loves Disney was recorded between Paris, London and Los Angeles by a dream cast. It is incredibly coherent, as if all participants had agreed to pay a rightful tribute to the most beautiful and symbolic tunes of Walt Disney’s magic world, as if nothing was too good for the stars when they revisited the classics and the sweet childhood memories connected to them. Available November 18, 2016, Disney Loves Jazz is a must have for your music collection. Inspiration, relaxation and a great new way to introduce the little ones to Jazz! I love that you can even order it on Vinyl! Just trust me, this one is one you will want to listen to over and over again! I love the French version of Bibbidi-Bobbidi-Boo performed by Stacy Kent. Her voice is amazingly smooth and the words in French seem so beautiful to me! French is the language of love for a reason, but I think the beauty in it is the most ‘love’ one can find! The Bare Necessities is so much fun too! It already had it’s own jazz feeling and these artists put it over the top! They had me moving as I listen to Jazz Loves Disney! Being an ungrateful, petulant child is annoying. (okay, so this is one you are reminded of if your toddler insists on watching Beauty and the Beast over and OVER and over again!) I had never quite grasped what an ungrateful child Belle was. Don’t believe me, just watch it over and over. You’ll get it! Stinks too because that is one of my very favorites! Sunshine Collective is a fun collection of happy music that simply makes you want to enjoy it. Sunshine is definitely a good name, as it really does feel like you are listening to a little sunshine! I’d definitely suggest this for Moms and daughters as it just seems to me music perfect for girl time on a beautiful day! The various songs bring a smile to your face and warmth to your heart as it lifts you up one song at a time. To quote the song Up to Something Good, ” the world needs a smile and it’s here”. That definitely sums up this album. Check it out today. It will be your next go to happy music! Sunshine Collective creates an intricate and sophisticated vocal/instrumental tapestry that defines each track as a true musical composition. Arbuckle and Richards don’t pander to low expectations of children’s listening abilities by simply laying “kiddie lyrics” on top of a basic 3-chord musical structure. Recognizing that children are responsive to music that has sonic complexity and lyric depth, the team purposefully delivers a break from typical kids’ fare, keeping it fresh, cool, and “adult ear” friendly. Up To Something Good has a roll-down-the-windows, flyin’ free feel, but its summertime sweetness isn’t sticky or syrupy; it’s refreshing as cold fruit at a hot picnic. The album’s powerful instrumental ensemble flexes its muscles while never intruding on Stephanie Richards‘ vocal tone and style or her crystal clear delivery of the lyrics. Her eminently ear-friendly voice serves up mod pop and jazz-tinged tunes just as deftly as pop-country, four-on-the-floor, head-for-the-sun numbers. The title track is pure pop heaven: bold, brassy, and pulsating with life as Richards’ powerhouse soprano soars over a complex orchestration in a manner reminiscent of ’60s stars like Martha Reeves or Diana Ross. The album’s non-hackneyed lyric landscape is best exemplified by the poetic poignancy of “Waiting To Say Hello Again,” a gently country waltz that explores how childhood often copes with parting. Before launching Sunshine Collective, Brian Arbuckle and Stephanie Richards had an R&R pop chart hit with Stephanie’s debut single, “Get Use To It.” Arbuckle’s orchestral compositions can be heard on trailers for Benchwarmers, Catwoman, and Spider, among others, as well as network promos for shows like Cold Case, Big Bang Theory, and 60 Minutes. He has mixed music for Sprout, Disney, Disney XD, and Nickelodeon, and he is currently in music production for a new Simpsons promo campaign. 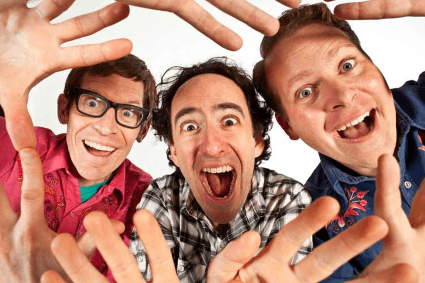 Josh & the Jamtones have been making music and lots of laughs for kids and families since early 2012, when singer/songwriter Josh Shriber started buying fancy lattes from producer/drummer Pat Hanlin at a café near his house. Since then, the titanic twosome and their intrepid band have crisscrossed the country, playing hundreds of shows and sharing the stage with massive bands like The Wiggles, Yo Gabba Gabba, and The Fresh Beat Band. The Jamtones have performed at loads of major festivals with mega-acts like the Dave Matthews Band, Hall & Oates, and The Roots. More than 60,000 Jamtones records have been sold through Josh and Pat’s home-grown label, Jamhouse Records, scoring multiple hit singles on SiriusXM’s Kids Place Live channel and other kids’/family radio programs throughout the country. Jamhouse also functions as a full-fledged video production house and audio recording studio. I can’t even begin to say how much fun I had listening to the CD! It was a blast and I can’t wait to enjoy it with the little ones! I assure you that you’ll be laughing, singing and dancing along with these fun and creative songs! There are even a few things I’m certain were thrown in for Mom and Dad. While it’s hard to pick a favorite, I admit that after I finished initial playing of the CD for the review, I continued cruising to it or the remaining two hours of my road trip. LOL. So, at least you can know that it is something that when it becomes their favorite, you’ll at least enjoy the repeat plays! There is something about that boogie little ones get when they hear music that they enjoy. It always makes me smile and of course ensures that I boogie on with them. The laughter and joy that babies find in music is such a pure happiness. I’m not convinced any normal human being could resist that! Recently I had the pleasure of enjoying my cousin’s little one and decided she would be the best reviewer of anyone! So, I put in the Shy Kid Blues by Hullabaloo and cranked it up. Wasn’t long past the intro that those little knees started bending to their own rhythm and those adorable arms followed! At almost a year and a half, this girl loves her a good beat. Dancing and singing and moving to her own drum with that beautiful smile and big blue eyes. I didn’t get a shot of her dancing, I was busy dancing with her, but if you’ve ever seen a toddler dance then you know what I mean! 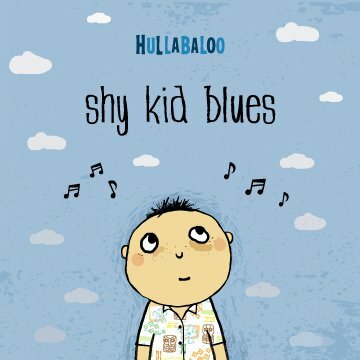 Hullabaloo has received some great shout outs, including a raving compliment from Parents Magazine hailing them “As good as it gets when it comes to children’s music.” One can’t resist that one, curiosity requires ya to check it out! LOL. Though I couldn’t find any songs from this album on YouTube, you can listen to them at their site. I’m not gonna lie, even if I am past their targeted demographic, Recess Monkey always makes me smile with their lyrics. They are fun and get ya moving! Much better than those kids songs that systematically make us want to blow up our own televisions! With each song I can picture a three year old’s version of what they are singing and can’t help grinning. I especially love when at the end of ‘Wired’ they end with what inevitably happens anytime little ones are bouncing off the wall! That actually made me giggle as I’ve seen that happen oh so many times! Recess Monkey, as always, hits the nail on the head with this fun and exciting collection of children’s music seemingly based off of Rock and Roll style music. 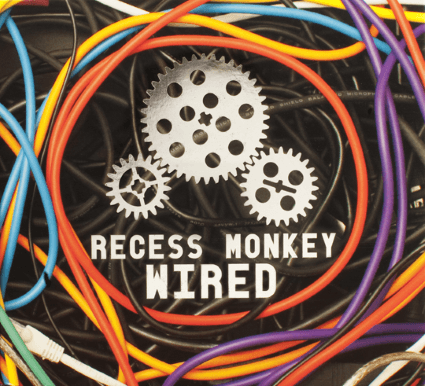 If you grew up in an era listening to Rock and Roll, or even if you didn’t, Recess Monkey will be the artist in your kid’s music collection that doesn’t make you want to scream in frustration but instead will get you playing, jumping and just moving in general. Simply listening while writing them takes discipline not to jump up and start moving! Wired was produced at John Vanderslice’s famed Tiny Telephone Recording in San Francisco, where everything was recorded on tape with analog equipment. Recess Monkey found working with John Vanderslice to be like observing the machinations of a mythic alchemist practicing his craft. Vanderslice and engineer Jamie Riotto created incredible effects “on the spot” during live takes, twisting knobs with one hand while altering the speed of the tape with another, bringing to Recess Monkey the realization that Vanderslice and Riotto weren’t simply producer and engineer, but truly members of the band. In addition to rocking out with Recess Monkey, Jack Forman is an on-air personality on SiriusXM’s Kids Place Live, where his daily call-in show, Live From the Monkey House, is a hysterical cornucopia of game show segments, kid callers, special musical guests, and the best kids’ and family music out there! Recess Monkey released their debut CD, Welcome to Recess Monkey Town, in 2005, followed by another popular hit, Aminal House, in 2006. The band made history with their 2007 release, Wonderstuff, the first double CD children’s album. As with all their albums, including 2008’s Tabby Road, 2009’s Field Trip, 2010’s The Final Funktier, 2011’s In Tents, and 2013’s Deep Sea Diver and Desert Island Disc, Wired is grounded in real life children’s experiences. Wired will be available at recessmonkey.com, amazon.com, cdbaby.com, theAVCafe.com, bigkids.com, iTunes, bandcamp.com, Silver Platters, Sonic Book Records, and Barnes & Noble.